FARWELL — It was a sunny, mild day in early April when I climbed into a drift boat with Jeff Johnson and Terry Drinkwine for an unusual day of trout fishing. Johnson, our gracious host, offered some Rice Krispies treats. Neither of us was hungry. The sweet satisfaction we had in mind swam somewhere deep in Johnson’s two-acre trout pond, hidden back in the woods. It is called Brookhaven Lake — and a haven it is. The lake is private and closed except when Johnson opens it to youth groups for free or to well-heeled anglers he guides for a fee. That in turn pays for the dream he shares with his son Michael: providing youths with a great place to learn fly fishing and trout conservation. “The water is 55 degrees year-round,” Johnson said cheerfully as he rowed around the pond, giving us plenty of casting room. Fifty-five degrees is good, just right for the big, Canadian Lake Nipigon brook trout Johnson stocks. It is perfect for the Arctic grayling he plants, too. I kid you not: Arctic grayling, the fish of dreams for many Michigan trout fans who lament the grayling’s demise at the turn of the 20th century. Their extinction in Michigan was the result overfishing and logging drives that pushed tons of sand into rivers, covering spawning beds. “When we were kids, my dad would take us to Grayling for the trout opener. We’d eat at a breakfast place with a stuffed grayling on the wall. It was our good luck ritual,” Johnson said. Johnson’s father, George Johnson, passed away two years ago. He was 72 and a lifelong fly fisher. He had come to know Paul Young, the legendary cane-rod builder and fly-fishing pioneer from Detroit. George Johnson swept floors at Young’s shop for no pay. “After school and his paper route, he would hang out at the shop,” Johnson said. “Paul gave him some flies to get him started. George Johnson left his son and grandson an inheritance, and Jeff Johnson said they decided to do something to honor his dad’s memory. They bought some land with a perfect pond, then approached Scott and Vince Schulz in Gladwin, owners of Blue Springs Fish Farm. They struck a deal: Johnson would bring in Canadian grayling eggs and pay for a new hatchery unit. The grayling project began two years ago with 30,000 eggs. Johnson today has 1,500 grayling to show for it. The rest will be introduced later in the summer. “The idea was to have a place where kids could come and learn to fly fish for free and about Michigan’s trout heritage,” said Johnson, who owns a jewelry shop in Imlay City. “We’re closed to anglers in June and July and do nothing but kids then. Up in the bow of the drift boat, Drinkwine was realizing the possibilities. 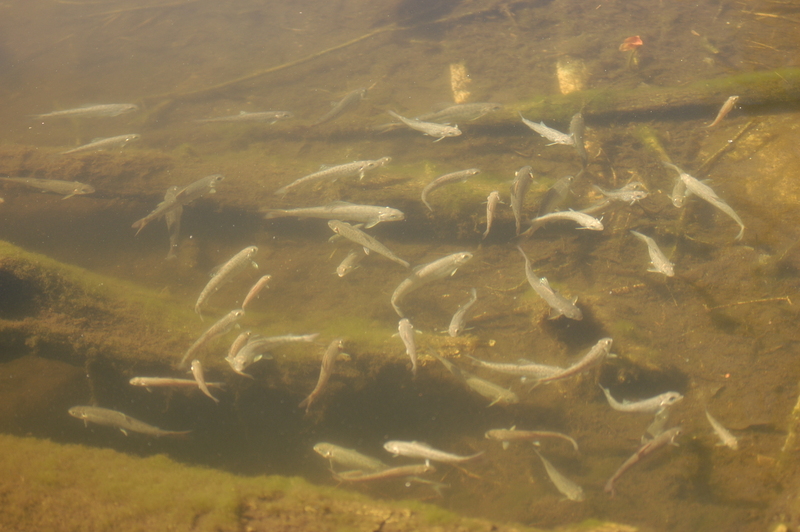 Johnson also stocked the lake with 1,500 brook trout. Some are now reproducing. They average 10 inches, but many are much larger. “Whoa, that was a big fish,” Drinkwine exclaimed after a large brook trout rose to take his fly. Drinkwine is a member of the Michigan Fly Fishing Club, an outdoors writer from Royal Oak and a friend of the late George Johnson. “Whoa! Whoa! There’s one,” he said again soon after. Drinkwine was fishing a sink-tip line. His yellow streamer and bead-head nymph were down deep. Me? Well, I was all smiles, though I’d had no luck fishing shallower with a wet fly. The three of us circled the lake again. It was late afternoon when the trout started rising. The low-angle light seemed to have turned them on. It was about 4 p.m. when Drinkwine hooked the best fish of the day, a hefty, 16-inch brook trout. It took his fly with a flourish, and a landing net was needed. “This is a beautiful brookie,” Drinkwine said, holding it up for all to see. And it was. Just to see it was special. Terry Drinkwine holds up one of the nice brook trout he caught on Brookhaven Lake with a yellow streamer and beadhead nymph combination. Johnson hopes many will come to experience the fishing at Brookhaven as well as walk the property. 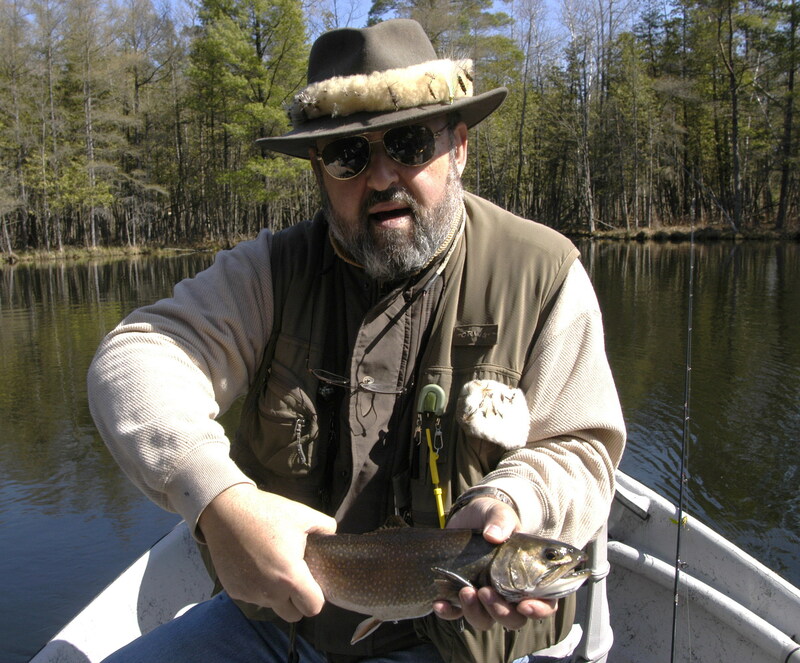 He is constructing a memorial nature trail to honor many Michigan trout fishing icons, such as Art Neumann, the founder of Trout Unlimited, and Upper Peninsula author John Voelker, who penned “Trout Madness” under the pseudonym Robert Traver. If you’d like to know more about the free youth programs at Brookhaven Lake or about how to spend the day fishing it with a guide, visit brookhaven-lake.com or call Jeff Johnson at 313-510-0928. This entry was posted in Uncategorized and tagged Brook Trout, Brookhaven Lake, Fishing, Fly Fishing, Grayling, Jeff Johnson. Bookmark the permalink.